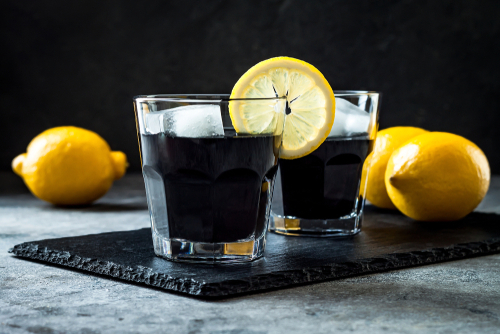 Dare we say “Bottom’s Up?” You may be seeing black charcoal drinks popping up everywhere. It’s kind of a trendy thing right now. Black, sleek, and sophisticated right? Absolutely. All while giving yourself a good dose of detox. Ah, the best of both worlds. And if you haven’t seen it, now you probably will. You’re welcome. Whether you’ve seen it or not, the question is have you tried activated charcoal yet? It's certainly something I always have in my cabinet for a random case of the stomach bug. Activated Charcoal has actually been used for years in hospitals as a "poison control." But it's definitely making a come back in "healthy households" today. It is is a food grade charcoal made from coconut, peat, coal, or wood. It binds to poisons or toxins and prevents them from being absorbed from the stomach into the gut. But don't be going to your grill in the summer and scooping off the "charcoal" from your leftover dinner. That's not what we're talking about here. It's actually a term called ADsorption and not ABsorption. So it's best to drink it alone and not in a green juice or with a healthy meal because it could cause the nutrients from that meal to not be absorbed. And if you're taking medication, I would advise against or talk to your doctor. It could even limit the effects of your prescriptions. It's pretty powerful stuff. If your kids get a stomach flu or begin vomiting every couple hours, give them activated charcoal pills and it will usually stop the vomiting. We want to be regularly detoxing our bodies via our bowel movements and lymph system. With all the harmful chemicals our bodies are exposed to today, it's important to detox our livers. But be mindful, it may make your poop black. No need to google "black poop". I warned you. 1. In a drinkable mason jar with a lid, combine your liquid and your chia seeds. 2. Shake and allow to sit for 15 min. 3. Shake again to allow for no clumps. 5. Bottoms up and Enjoy!